Rust is a blazingly fast new language which guarantees thread safety! Our latest project, a command line tool to identify random components by their SHA values, is implemented in Rust. As we use Rust for our own purposes we want to track Rust dependencies of course 🙂 That’s why added support for Rust now! VersionEye is tracking more than 9K Rust packages from crates.io now and they are all available through our public search. Beside that VersionEye can parse cargo.toml and cargo.lock files. If you are using cargo to manage your Rust dependencies then you can let VersionEye monitore those files to receive notifications about new releases of your dependencies. The above screenshot shows a Rust project which is monitored directly on GitHub. This integration is still very fresh. Please try it out and give us feedback! VersionEye is monitoring now more than 1.2 Million open source projects and collecting all kind of meta information to this projects. One kind of the meta information is the corresponding license. Currently the VersionEye database contains licenses to more than 8 Million artefacts. However, sometimes the maintainers of a project didn’t provide the license information that way that it’s easy to read and recognise for machines. That is specially the case for Python and the .NET platform. Take for example the gpkit Python library. In the license field they provided the full license text, not just the license name. That doesn’t match very well with the license whitelist in VersionEye 😉 That’s why we improved it now! In Nuget, the package manager for the .NET platform, many license names look like this. “Nuget unknown”. That is the case if the maintainers provided a license link but didn’t provide a license name. Our new license crawler is now following this links and with machine learning it tries to identify a known license. If the similarity to a known license text is higher that 90% we assign the corresponding SPDX identifier to the software library in our database. And now the same package looks like this and you can see immediately that it’s the MIT license! This are just the first results. Of course this is also work in progress and the recognition will become better in future. Today we released the VersionEye Maven Plugin 3.10.2. This patch release is fixing a bug which occurred on big multi module projects, where sometimes the project_id couldn’t be found. Beside that the logging is improved. Now the plugin will log out at which places it is looking for the project_id. That way it’s easier do debug if something goes wrong. We just added the Spryker PHP repository to our crawling framework. The Spryker PHP repository contains several packages for the Spryker commerce framework. Currently VersionEye is tracking 110 Spryker packages on an hourly basis. With fixed releases and snapshots together VersionEye is currently monitoring more than 70K open source .NET packages on Nuget. Here are the numbers from .NET / Nuget compared with package managers from other languages. The above chart can be viewed on the VersionEye statistic page and is updated once a week. The numbers representing projects in official package mangers. Random OS projects on GitHub/Bitbucket are not taken into the calculation! Currently the C# .NET community has less open source packages than the Python, Ruby, PHP, Java or Node.JS community. As Microsoft changed their open source strategy a couple months ago, this might change in future. But this is the status quo! Every .NET package has his own page at VersionEye, like this one for example. Now you can follow any .NET package at VersionEye and you will receive an email notification as soon a new release for that package is available. But that’s not all. VersionEye is showing the most important KPIs to the package in the right upper corner. KPIs like average release time, external references, the license of the package and a dependency badge which can be integrated into README pages at GitHub, GitLab and Bitbucket. VersionEye is also creating author profiles for the contributors of the open source libraries. By clicking on an author icon on a package detail page the author page shows up. Like this one for example. On the author page you can see to which other .NET packages the author contributed to and what his/her keywords are. The keywords are clickable as well. This is for example the keyword page for JSON. The keyword page can be filtered down by language and now C# is on the filter as well. But the coolest feature is that VersionEye can monitor a Nuget project in your Git repository and notify you about out-dated dependencies and license violations. 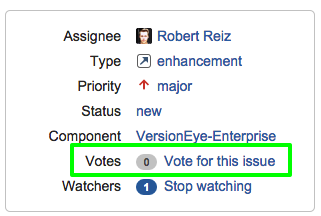 Now VersionEye can monitor project.json and *.nuspec files on GitHub, Bitbucket and Stash. For monitoring one of this files, simply flip the switch in our Git integration view. The project report looks like that. 2 Things are still not finished for the .NET integration and are still ongoing. Release Dates: On some packages you will see “Release 116 years ago”. Of course that is wrong 🙂 On some packages the release date was not set correctly. Currently a background job is running which is fetching the release dates from an alternative source. License Names: The Nuget API doesn’t expose license names, only links to licenses. Currently we are working on it to resolve the links to meaning full names. For a couple thousand packages this is already done but for the majority this process is still ongoing. Now VersionEye has support for Chef! VersionEye is crawling supermarket.chef.io at least once a day and is able to monitor your Berksfile, Berksfile.lock and metadata.rb file on GitHub, Bitbucket or Stash. We at VersionEye are always interested into your Feedback! Right from the beginning the feedback icon was part of the main menu at VersionEye. By clicking on the feedback icon a modal dialog appeared where you could send a message to the VersionEye Team. We received your feedback as email and it was not visible to anybody else. Many times we received a bug/feature report multiple times. Simply because many users found the same issue. A couple days ago we changed the behaviour of the feedback icon. Instead of opening a modal dialog it redirects the user to the ticket system on Bitbucket. 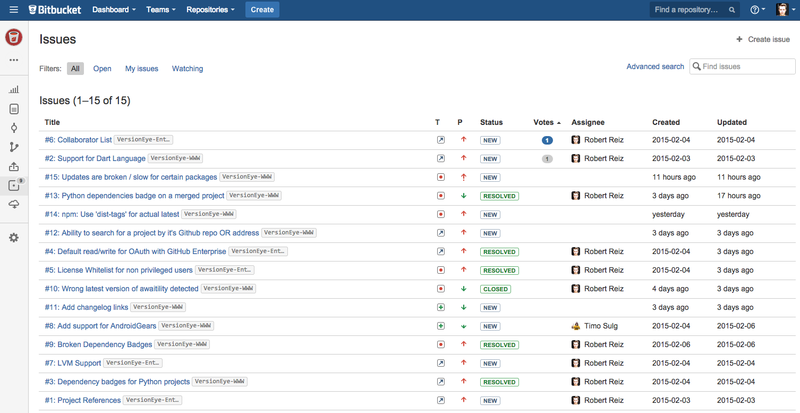 Everybody can sign up for free at Bitbucket and open a ticket for VersionEye. The tickets are visible for everybody! Even for users who are not singed up a Bitbucket! Why Bitbucket? Why not GitHub? The code for VersionEye is splittet up in over 10 git repositories. For long time we hosted everything on GitHub and we used internal the GitHub ticket system for ourselves. There are 2 reasons why we moved some repositories to Bitbucket. On Bitbucket you can make the ticket system public and at the same time keep the source code private. The Ticket system on Bitbucket is a little bit more advanced. Specially the “vote” feature is very useful for communities. That way users can vote for a ticket and we can sort the tickets by votes. That is very useful for new feature requests. Now we don’t have to guess anymore which feature to implement first. We simply implement the features first with the most votes! We still have code on GitHub and we are still paying customers of GitHub. Simply because the performance of GitHub is better. A ‘git push’ or ‘git checkout’ works on GitHub always a couple seconds faster than on Bitbucket. With git you can have multiple backends without a problem 🙂 That’s why we all love git!